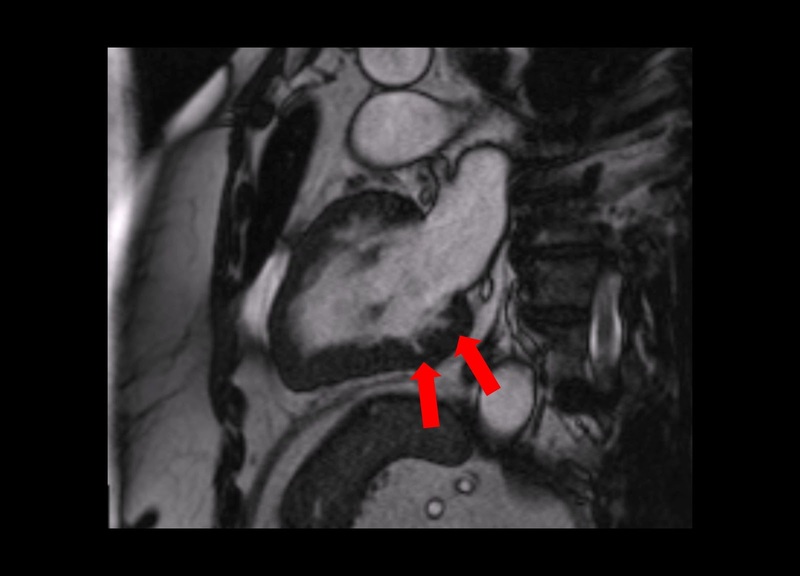 Over recent years there has been interest, and debate, about the significance of myocardial crypts seen on cardiac MRI scanning. Crypts (also known as clefts, crevices or fissures) are defined as an invagination of the myocardium that penetrates >50% of the myocardial thickness in diastole. An example is shown in the figure below: here there are two crypts in the inferior wall. So are myocardial crypts significant? It has been suggested that they may represent a 'prephenotypic marker' of hypertrophic cardiomyopathy, based upon a 2012 paper in which crypts were found with a high prevalence in genotype-positive (phenotype-negative) hypertrophic cardiomyopathy patients, but in none of a normal control group. More recently, however, a study has shown that they are not uncommonly seen as an incidental finding in cardiac MRI studies, with an overall prevalence of 6.7%, although the prevalence is higher in patients with hypertrophic cardiomyopathy, myocarditis and hypertension. So are myocardial crypts significant or not? The jury is still out, but for now the incidental finding of myocardial crypts, especially if multiple, should always prompt a careful review for any other imaging findings, clinical features or family history that might point towards a diagnosis of hypertrophic cardiomyopathy. Maron MS, et al. Prevalence and Clinical Profile of Myocardial Crypts in Hypertrophic Cardiomyopathy. Circulation: Cardiovascular Imaging 2012; 5: 441-447. Petryka J, et al. Prevalence of Inferobasal Myocardial Crypts Among Patients Referred for Cardiovascular Magnetic Resonance. Circulation: Cardiovascular Imaging 2014; 7: 259-264.